This article is about the language. For Ancient Greek population groups, see List of ancient Greek tribes. "Classical Greek" redirects here. For the culture, see Classical Greece. For other uses, see Greek (disambiguation). The Ancient Greek language includes the forms of Greek used in Ancient Greece and the ancient world from around the 9th century BCE to the 6th century CE. It is often roughly divided into the Archaic period (9th to 6th centuries BCE), Classical period (5th and 4th centuries BCE), and Hellenistic period (Koine Greek, 3rd century BCE to the 4th century CE). It is antedated in the second millennium BCE by Mycenaean Greek and succeeded by medieval Greek. Koine is regarded as a separate historical stage of its own, although in its earliest form it closely resembled Attic Greek and in its latest form it approaches Medieval Greek. Prior to the Koine period, Greek of the classic and earlier periods included several regional dialects. Ancient Greek was the language of Homer and of fifth-century Athenian historians, playwrights, and philosophers. It has contributed many words to English vocabulary and has been a standard subject of study in educational institutions of the Western world since the Renaissance. This article primarily contains information about the Epic and Classical periods of the language. ✪ Most SURPRISING Facts About The Ancient Greeks! It’s 427 BCE and the worst internal conflict ever to occur in the ancient Greek world is in its fourth year. The Peloponnesian War is being fought between the city-states of Athens and Sparta, as well as their allies. The Athenians can’t match the formidable Spartan army on land. So they’ve abandoned the countryside and moved inside the walls surrounding their city and port, now provisioned by a superior fleet and extensive maritime empire. The cramped conditions have taken a toll and a recent plague wiped out a third of the population. But city life goes on. Archias and Dexileia live in the center of Athens. As a painter of high-class pottery, Archias is relatively well-off and takes great interest in the city’s affairs. Dexileia, on the other hand, can't participate in politics or own property. The couple are grateful to the gods that three of their four children, a son and two daughters, have survived past infancy. Many parents see daughters as a liability since they require dowries to find husbands. But Archias is confident that his wealth will allow him to make good matches for them without going bankrupt. Like many Athenians, the family owns slaves. Originally from Thrace, they were captured in war. Thratta does most of the housework and helps raise the children. Philon is a paidagôgos, who supervises the son’s education, teaching him reading and writing. Archias is up early because there’s a meeting of the Ekklêsia, the assembly of citizens, taking place at dawn. Before setting out, he burns incense and pours a libation at the small shrine in the courtyard on behalf of his entire household. Dexileia will remain at home all day, teaching her daughters domestic skills. Later, she’ll retire to the inner courtyard for some fresh air. When Archias arrives at the agora, the civic and commercial heart of the city, he finds the square swarming with his fellow citizens, native-born adult males who have completed military training. Attached to the central monument is a noticeboard with the meeting’s agenda. Today, there’s only one item of discussion: what to do with the people of Mytilene, a city on the island of Lesbos where a revolt against Athenian rule has just been put down. The meeting takes place on a hill west of the acropolis known as the Pnyx. The word means “tightly packed," and the crowd of 5,000 citizens makes it clear why. The heralds purify the hill by sprinkling its boundary with pig’s blood and call for order. As everyone sits on benches facing the platform, the presiding officer opens the meeting with the words: “Tis agoreuein bouleutai?” “Who wishes to address the assembly?” One by one, citizens speak, some advising mercy, others bent on vengeance. A motion is proposed to execute all the Mytileneans and enslave their women and children because they betrayed their Athenian allies during a time of war. A majority raises their right hands in favor. Once the meeting’s over, Archias heads back to the agora to buy food and wine. Hundreds have gathered there to discuss the results, many unhappy with the decision. When Archias returns home, he tells Dexileia about the debate. She thinks that killing the innocent as well as the guilty is harsh and counterproductive, and tells him as much. Around dusk, Archias goes to a friend’s house for a symposium. The nine men drink wine and discuss the meeting well into the night. Archias shares his wife’s opinion urging mercy, and his friends eventually agree. Before dawn, something unprecedented happens. Heralds circulate throughout Athens announcing the council has called another meeting. The second debate is equally heated, but a new resolution, to execute only the leaders of the revolt, narrowly passes. Yet there’s a problem – a ship with orders to carry out the first resolution was dispatched the previous day. And so another ship quickly sets sail to countermand the order – a race of democracy against time. Ancient Greek was a pluricentric language, divided into many dialects. The main dialect groups are Attic and Ionic, Aeolic, Arcadocypriot, and Doric, many of them with several subdivisions. Some dialects are found in standardized literary forms used in literature, while others are attested only in inscriptions. There are also several historical forms. Homeric Greek is a literary form of Archaic Greek (derived primarily from Ionic and Aeolic) used in the epic poems, the "Iliad" and "Odyssey", and in later poems by other authors. Homeric Greek had significant differences in grammar and pronunciation from Classical Attic and other Classical-era dialects. The origins, early form and development of the Hellenic language family are not well understood because of a lack of contemporaneous evidence. Several theories exist about what Hellenic dialect groups may have existed between the divergence of early Greek-like speech from the common Proto-Indo-European language and the Classical period. They have the same general outline, but differ in some of the detail. The only attested dialect from this period[note 1] is Mycenaean Greek, but its relationship to the historical dialects and the historical circumstances of the times imply that the overall groups already existed in some form. Scholars assume that major Ancient Greek period dialect groups developed not later than 1120 BCE, at the time of the Dorian invasion(s)—and that their first appearances as precise alphabetic writing began in the 8th century BCE. The invasion would not be "Dorian" unless the invaders had some cultural relationship to the historical Dorians. The invasion is known to have displaced population to the later Attic-Ionic regions, who regarded themselves as descendants of the population displaced by or contending with the Dorians. Distribution of Greek dialects in Greece in the classical period. Pamphylian Greek, spoken in a small area on the southwestern coast of Anatolia and little preserved in inscriptions, may be either a fifth major dialect group, or it is Mycenaean Greek overlaid by Doric, with a non-Greek native influence. Most of the dialect sub-groups listed above had further subdivisions, generally equivalent to a city-state and its surrounding territory, or to an island. Doric notably had several intermediate divisions as well, into Island Doric (including Cretan Doric), Southern Peloponnesus Doric (including Laconian, the dialect of Sparta), and Northern Peloponnesus Doric (including Corinthian). The Lesbian dialect was Aeolic Greek. 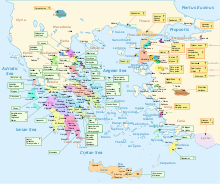 After the conquests of Alexander the Great in the late 4th century BCE, a new international dialect known as Koine or Common Greek developed, largely based on Attic Greek, but with influence from other dialects. This dialect slowly replaced most of the older dialects, although Doric dialect has survived in the Tsakonian language, which is spoken in the region of modern Sparta. Doric has also passed down its aorist terminations into most verbs of Demotic Greek. By about the 6th century CE, the Koine had slowly metamorphosized into Medieval Greek. Ancient Macedonian was an Indo-European language at least closely related to Greek, but its exact relationship is unclear because of insufficient data: possibly a dialect of Greek; a sibling language to Greek; or a close cousin to Greek, and perhaps related to some extent, to Thracian and Phrygian languages. The Macedonian dialect (or language) appears to have been supplanted by Attic Greek in the Hellenistic period. Recent[when?] epigraphic discoveries in the Greek region of Macedonia, such as the Pella curse tablet, suggest that ancient Macedonian might have been a variety of North Western Ancient Greek. The pronunciation of Ancient Greek was very different from that of Modern Greek. Ancient Greek had long and short vowels; many diphthongs; double and single consonants; voiced, voiceless, and aspirated stops; and a pitch accent. In Modern Greek, all vowels and consonants are short. Many vowels and diphthongs once pronounced distinctly are pronounced as /i/ (iotacism). Some of the stops and glides in diphthongs have become fricatives, and the pitch accent has changed to a stress accent. Many of the changes took place in the Koine Greek period. The writing system of Modern Greek, however, does not reflect all pronunciation changes. Greek, like all of the older Indo-European languages, is highly inflected. It is highly archaic in its preservation of Proto-Indo-European forms. In Ancient Greek, nouns (including proper nouns) have five cases (nominative, genitive, dative, accusative, and vocative), three genders (masculine, feminine, and neuter), and three numbers (singular, dual, and plural). Verbs have four moods (indicative, imperative, subjunctive, and optative) and three voices (active, middle, and passive), as well as three persons (first, second, and third) and various other forms. Verbs are conjugated through seven combinations of tenses and aspect (generally simply called "tenses"): the present, future, and imperfect are imperfective in aspect; the aorist (perfective aspect); a present perfect, pluperfect and future perfect. Most tenses display all four moods and three voices, although there is no future subjunctive or imperative. Also, there is no imperfect subjunctive, optative or imperative. The infinitives and participles correspond to the finite combinations of tense, aspect, and voice. Syllabic reduplication: Most verbs beginning with a single consonant, or a cluster of a stop with a sonorant, add a syllable consisting of the initial consonant followed by e. An aspirated consonant, however, reduplicates in its unaspirated equivalent: Grassmann's law. The earliest extant examples of ancient Greek writing (circa 1450 BCE) are in the syllabic script Linear B. Beginning in the 8th century BCE, however, the Greek alphabet became standard, albeit with some variation among dialects. Early texts are written in boustrophedon style, but left-to-right became standard during the classic period. Modern editions of Ancient Greek texts are usually written with accents and breathing marks, interword spacing, modern punctuation, and sometimes mixed case, but these were all introduced later. Ancient Greek is also taught as a compulsory subject in all Gymnasiums and Lyceums in Greece. Starting in 2001, an annual international competition "Exploring the Ancient Greek Language and Culture" (Greek: Διαγωνισμός στην Αρχαία Ελληνική Γλώσσα και Γραμματεία) was run for upper secondary students through the Greek Ministry of National Education and Religious Affairs, with Greek language and cultural organisations as co-organisers. It appears to have ceased in 2010, having failed to gain the recognition and acceptance of the teacher community. Modern authors rarely write in Ancient Greek, though Jan Křesadlo wrote some poetry and prose in the language, and Harry Potter and the Philosopher's Stone and some volumes of Asterix have been translated into Ancient Greek. Ὀνόματα Kεχιασμένα (Onomata Kechiasmena) is the first magazine of crosswords and puzzles in Ancient Greek. Its first issue appeared in April 2015 as an annex to Hebdomada Aenigmatum. Alfred Rahlfs included a preface, a short history of the Septuagint text, and other front matter translated into Ancient Greek in his 1935 edition of the Septuagint; Robert Hanhart also included the introductory remarks to the 2006 revised Rahlfs–Hanhart edition in the language as well. Akropolis Worlds News reports weekly a summary of the most important news in ancient Greek. An isolated community near Trabzon, Turkey, an area where Pontic Greek is spoken, has been found to speak a variety of Greek that has parallels, both structurally and in its vocabulary, to Ancient Greek not present in other varieties. As few as 5,000 people speak the dialect, and linguists believe that it is the closest living language to Ancient Greek. Ancient Greek is often used in the coinage of modern technical terms in the European languages: see English words of Greek origin. Latinized forms of Ancient Greek roots are used in many of the scientific names of species and in scientific terminology. ^ Imprecisely attested and somewhat reconstructive due to its being written in an ill-fitting syllabary (Linear B). ^ Hammarström, Harald; Forkel, Robert; Haspelmath, Martin, eds. (2017). "Ancient Greek". Glottolog 3.0. Jena, Germany: Max Planck Institute for the Science of Human History. ^ "W.B. Lockwood, "A panorama of Indo-European languages", Hutchinson University Library, London, p.6" (PDF). ^ Palmer, Leonard (1996). The Greek Language. Norman, OK: University of Oklahoma Press. p. 262. ISBN 978-0-8061-2844-3. ^ "Ministry publication" (PDF). www.edscuola.it. ^ "Ancient Greek 'to be taught in state schools'". Telegraph.co.uk. 30 July 2010. Retrieved 3 May 2015. ^ "Now look, Latin's fine, but Greek might be even Beta", TES Editorial, 2010 - TSL Education Ltd.
^ "Ωρολόγιο Πρόγραμμα των μαθημάτων των Α, Β, Γ τάξεων του Hμερησίου Γυμνασίου". Retrieved 3 May 2015. ^ "ΩΡΟΛΟΓΙΟ ΠΡΟΓΡΑΜΜΑ ΓΕΝΙΚΟΥ ΛΥΚΕΙΟΥ". Retrieved 3 May 2015. ^ "Annex to 2012 Greek statistics" (PDF). UNESCO. 2012. p. 26. Retrieved 14 December 2018. ^ "Asterix speaks Attic (classical Greek) - Greece (ancient)". Asterix around the World - the many Languages of Asterix. 22 May 2011. ^ "Enigmistica: nasce prima rivista in greco antico 2015". 4 May 2015. Retrieved 10 September 2018. ^ Rahlfs, Alfred, and Hanhart, Robert (eds. ), Septuaginta, editio altera (Deutsche Bibelgesellschaft, 2006). ^ a b "Akropolis World News". www.akwn.net. Chantraine, Pierre. Dictionnaire étymologique de la langue grecque, new and updated edn., edited by Jean Taillardat, Olivier Masson, & Jean-Louis Perpillou. 3 vols. Paris: Klincksieck, 2009 (1st edn. 1968-1980). For a list of words relating to Ancient Greek, see the Ancient Greek language category of words in Wiktionary, the free dictionary. Online Greek resources – Dictionaries, grammar, virtual libraries, fonts, etc. "Greek Language" . Encyclopædia Britannica (11th ed.). 1911.